Over 40 Amateur Of The Week: 44 And Ready For More! Lifting has always been there for Steve. Injuries derailed his competition dreams temporarily, but the weight room always took him back. See how his competition goals became reality! After my divorce in 1991, I started working out as a stress reliever and fell in love with the changes and feeling of training. I started making huge changes and feeling better all-around. Competing was something I always wanted to do but thought I couldn't. In 2003, I was involved in a motorcycle accident and sustained a compound fracture in my radius and ulna. The bone broke through the skin and ground on the pavement. I had a gap between my bone and my arm repaired by screws and stitches. The doctor told me I had to quit being a firefighter and working out. I was devastated and wanted to prove them wrong. Through the power of prayer, my bone grew back together, the screws and stitches were taken out, and I'm still a firefighter and lifter to this day. In 2010, there was a large chemical plant fire that we had to fight for 24 hours. I tried to go home and get some rest, but couldn't. When my wife, Lindsay, got home from work, we went straight to the gym because I wanted to work off the stress of the day before. As I was bench pressing, I heard a loud tear and felt my left pectoral muscle start burning. I immediately sat up and my wife rushed over and asked what was wrong. I told her that I tore something and we went straight to the ER. Due to dehydration and strain, I tore my pectoral. The orthopedic surgeon said it couldn't be fixed by surgery. I had to learn to strengthen it. Again, I thought any chance I had to compete was over. I became self-conscious about my chest but continued to train hard. This past July, my wife and I went to Las Vegas and watched the USAs. There were men competing who sustained the same injury I did, which totally changed my outlook. 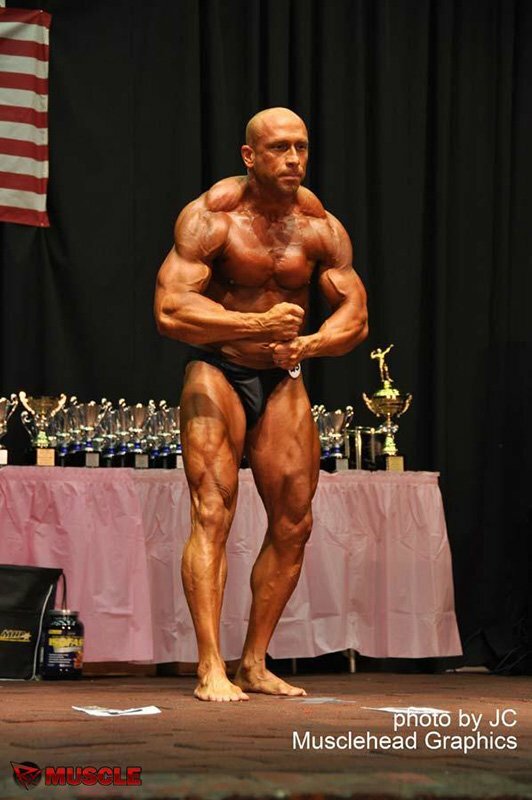 My wife and I began looking at a local show and decided to compete in the 2012 Tricky Jackson Classic, me as a bodybuilding middleweight, and she in figure. We trained hard and dieted 110 percent. On October 27, 2012, we competed in our first show. I placed second in the Master's 40 Division, and much to my surprise, second in the middleweight open against people half my age. I'm now nationally qualified in both events and driven more than ever to prove age and obstacles can't hold you down. I'm a professional firefighter, so my work schedule dictates my workout schedule. I train two days on with the third day (duty day) being abs only. I train instinctively and constantly change routine and exercises. My nutrition is simple. Food is fuel. I eat to live. I eat six meals per day and consume the majority of my carbohydrates for breakfast and around my workout. My drive to improve and keep getting better is being a healthier, stronger person for my job and my personal life. As I get older, I see people who give up and stop living. I plan to be healthy and active and show people what someone can accomplish as they get older. My motivation comes from many bodybuilders throughout the years. No one can say Arnold isn't a great inspiration. I have also always looked up to Lee Haney. I believe he is a wonderful role model for the sport. 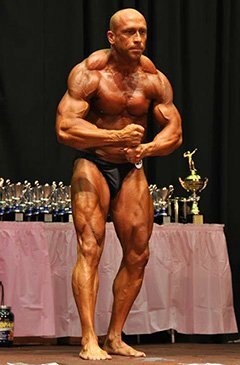 One of my favorite present competitors is Mark Dugdale; a business man, family man, Christian, and competitive bodybuilder. My inspiration comes from the Bible. Inspiration for everything I do comes from the Bible in one form or another. I qualified for national level shows at my first show this year. I don't feel I'm ready for that level at this time. 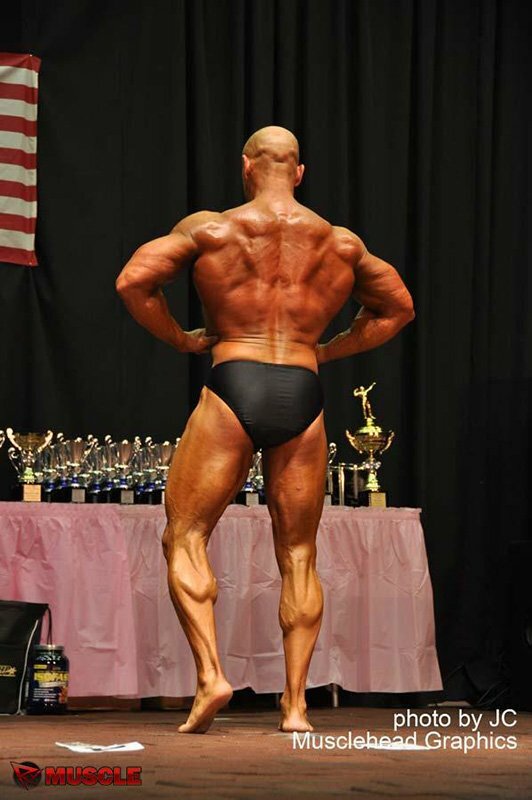 I plan to take a year off and do the same show next year to re-qualify for nationals and compete at the masters nationals in 2014. Never give up, set your goals high, and don't stop until you achieve them. Who Is Your Favorite Bodybuilder or Fitness Athlete? There are many, but Lee Haney is the one I admire most. Bodybuilding.com is a wealth of information. I researched everything I did to get in contest shape and it seemed most of the articles were on Bodybuilding.com. They have info on everything from diet and supplementation to tanning and posing. What a wonderful tool to have at our disposal, and it's free!